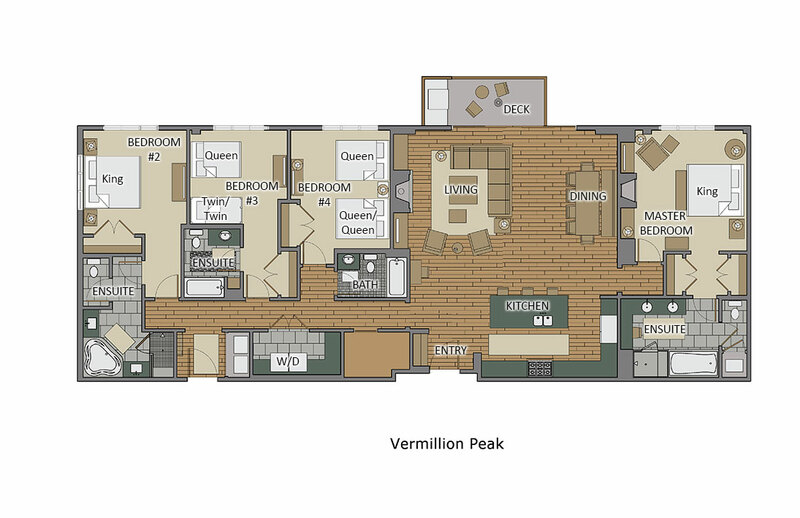 The Vermillion Peak Residence looks out to the Plaza of the ski base. This private, luxury residence exudes contemporary elegance and is crafted with meticulous attention to detail. The slope side, private residences at One Steamboat Place are located at the Gondola and offer ultimate ski-in, ski-out access. The Residence features a spacious living area with large fireplace. Its open floor plan connects the living and dining areas to the kitchen providing plenty of room for the entire group to gather. State of the art a/v equipment provides hi definition entertainment after a full day of activities on the slopes or enjoying town. A professionally equipped kitchen with Viking appliances will delight any aspiring chefs or grill in the great outdoors at the built-in Viking gas grill on the deck. There is seating for 10 at the dining table and room to seat more at the kitchen island allowing everyone to eat together. All One Steamboat Place residences feature luxurious furnishings and décor throughout the home. Each master bedroom offers a gas fireplace and the master bath features a steam shower and Jacuzzi tub. The second master features a king bed and large ensuite bathroom. One of the remaining bedrooms has a queen over queen bunk bed and an additional queen bed with ensuite bathroom. The final bedroom has a twin over twin bunk bed and an additional queen bed. This bedroom shares its bathroom with the rest of the residence. We had a great time in steamboat, highlighted by our time at Vermilion Peak. The condo was perfect, and a great location above the gathering room and the front entrance and good views of the mountain. Our ski vacation with Moving Mountains was fabulous. We had a family of 11 with 4 kids under the age of 5. They did everything imaginable to make our trip as care free as possible, from stocking our fridge with our requested items, to receiving and delivering our special toys from home, to ordering AND delivering a special birthday cake and balloons for our two year old, to calling and checking on us throughout our stay...oh I almost forgot the personal chef, which made our stay so special! They exceeded our expectations in everyway...and the nicest people to deal with! I simply can't say enough good things about them. They are truly awesome!! !